From October 2019 to December 2019, the ICCS and Athena RC teams collaborated and performed experiments in the Special Elementary School of Piraeus for children with autistic spectrum disorder. BabyRobot was presented by partner ICCS in the occasion of “New Student Welcome Event and Academic Orientation” for Electrical and Computer Engineering students at National Technical University of Athens. 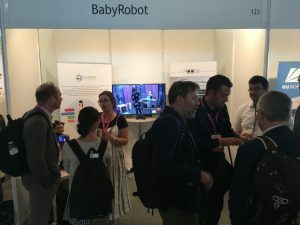 The BabyRobot project had an exhibition booth at the 2018 IEEE/RSJ International Conference on Intelligent Robots and Systems (IROS’2018), which took place in Madrid, Spain, October, 1-5, 2018. 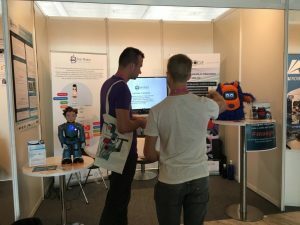 A team of researchers from BabyRobot partners ICCS (Georgia Chalvatzaki), Athena RC (Jack Hadfield) and Blue Ocean Robotics (Franziska Kirstein, Mamoun Gharbi, Diana Trifon) participated in the conference and demonstrated project results to a large number of conference attendees and visitors. This year’s 2018 IROS conference was the largest robotics event in the history, congregating over 3500 attendees, with more than 1200 speakers from 60 countries, and with a robotics fair that hosted over 150 exhibitors. BabyRobot was presented by partner ICCS in the occasion of “Paneuropean Researcher’s Night 2018. The objective of these events is to provide information about current research programs and achievements to students, researchers, the industry and the general public. Blue Ocean Robotics presented the Moogie Robot in Interspeech 2018, India. 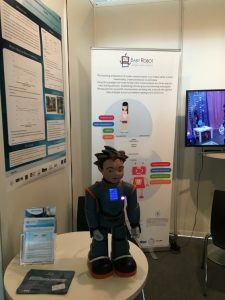 This paper relates to on-going research, conducted in the frames of the BabyRobot project, which aims at exploring the application of new adaptive reinforcement robot learning schemes in scenarios that involve social interaction of robots with children facing autism-spectrum disorder (ASD) conditions. 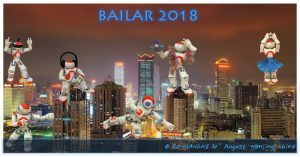 BabyRobot partner ICCS (Dr. Mehdi Khamassi) was a co-organizer of the 3rd Workshop on Behavior Adaptation, Interaction and Learning for Assistive Robotics (BAILAR 2018), which took place at the 27th IEEE International Symposium on Robot and Human Interactive Communication (RO-MAN’2018, http://ro-man2018.org/), Nanjing, China. During this workshop, Dr. Ben Robins (from BabyRobot partner UH) gave a keynote talk on the topic: “Robots as a therapeutic tool: encouraging communication and social interaction skills in children with autism”.